Discussion in 'Hosting' started by gmsniperx, Jul 10, 2015. Wow.. Some amazing speeds.. I will be ordering this very soon. Can I install virtualbox/vmware or similar on a windows VPS? Thank you for thread approval. Surely, Our servers will not disappoint you. Yes, We do have nested virtualization enabled so you can install virtualbox, vmware or similar. Yes, it is clearly mentioned that 80% discount is for first month only. Although our prices are highly competitive as compared to other hosting services providers. We are using enterprise grade SSD hard-disks with read/write speeds much much higher compared to normal ones. Ordered D2048 SSD VPS. 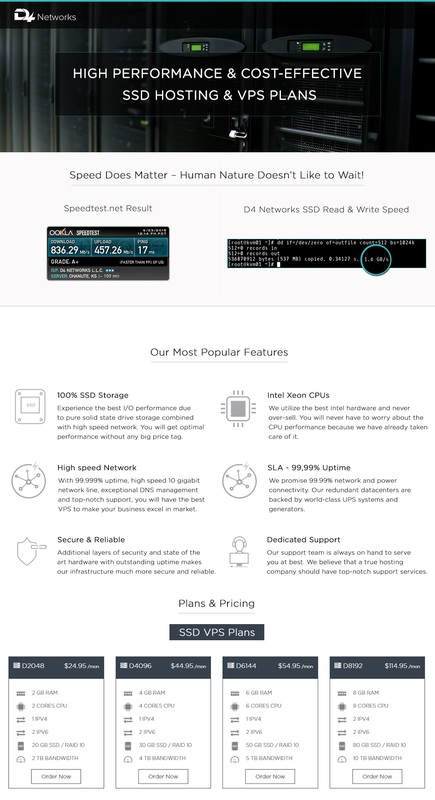 How long does it take to get VPS up and running? Thank you for placing an order, you VPS is up and running. Details have already been emailed to you. Will leave more depth review after using it for few days . Credit Card and Bitcoin payment options are available at the moment. May i know, what other payment options do you need? Ordered D4096 Standard VPS Plan. Thank you for placing an order. Your VPS details were emailed to you within 15 minutes of your order placement. Keep us informed about your experience of using our blazing fast SSD VPS. do you provie multipe ips in vps? Yes, you can add more IPs while making the order. If you have any specific requirements, leave a support ticket on our website. Thank you for placing an order for windows vps. Complete details have just been emailed to you.